Art historians working on histories of global exchange in the early modern period are often faced with the challenge of writing histories of travelling objects without the objects themselves, as they are so often lost or destroyed. The multiple copies produced of Louis XIV prints and medals that I’m working on has saved me from that fate, but they have presented me with other interesting conundrums. These objects don’t just have one life, but many lives accrued through the various itineraries that each different copy made around the world. The surviving examples of these prints and medals rarely bear physical marks of experience. It’s almost impossible to tell which particular print or medal went where and when and who they once belonged to. But I would like to argue all of the accumulated lives of travelling multiples transfer, at least conceptually, onto each and every copy of the prints from the same plates and medals from the same dies that do survive. The solution, Shalem suggests, is to view the object not just in terms of its place on a two-dimensional grid (imagine an object going from point a to point b on the map above), but to see it within a many layered series of connections that can account for simultaneous meanings across a variety of contexts. The diagram above is my first attempt to create a layered schema for a networked study of Louis XIV multiples. Here I have located the medal and print album at its origin point in France, I have then linked the different geographical locations via intermediaries who conveyed the gifts (in red). The recipients of gifts are indicated with a representative thumbnail of the gift that they received. If the gift was received in France, they are connected to both their place of origin, and the site of reception. I admit, that this layered diagram doesn’t quite answer Shalem’s call for a multi-dimensional model for the networked study of objects. While perhaps a little more advanced than the route plotted on a map, is still underpinned by a positivist tendency for empirical data: the who, what, where and when of the object exchange. The diagram above is my attempt to capture the multivalence that we need for our histories of travelling objects. The intangible experiences that an object undergoes throughout its life – the ‘ideas and memories’ of those through whose hands it passes – are not erased with each subsequent experience but accrued. The object does not cease to be French, and to mark the lives of members of its ruling family when a copy of this medal was gifted to the Amerindian warrior Nescambiouit. Nor should we forget that it once was given to an African man who played at being a Prince at the French Court. The extraordinary journey of an object just like that one that went to Persia only adds to its appeal as a symbol of global networks of exchange in the early modern world. Following James Clifford’s call in his 1997 study, Routes: Travel and Translation in the Late Twentieth Century, for an examination of the transitions, contact zones, and networks of people, I have not expressed world views in my layered diagram in terms of cultures, but of individual actors. Each of the agents named here led an exceptional life. Louis XIV and Shah Sultan Hosayn enjoyed extraordinary privilege, but neither of them left the lands over which they were sovereign. Aniaba and Nescambiouit became extraordinary through their experience of travel to the Court of France – a great rarity for people native to Africa and Canada at that time. The kind of networked study of travelling objects that I would like to propose, is not one that makes broad generalising claims about cultural contexts, but one that explores the individual agents and networks involved in the exchange of diplomatic gifts. Sadly, many, if not all of the travelling objects that I am working on have likely suffered the ultimate transformation. They have been lost and they are presumed destroyed. There are only two examples of the Gold Famille Royale medal presented with a loop that survive to my knowledge. 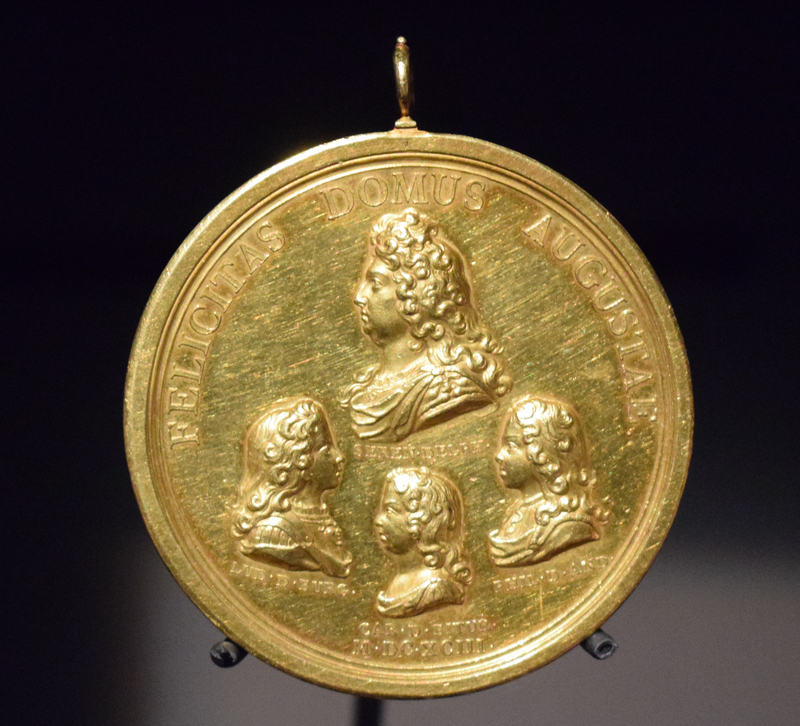 One of those medals (above) is held in the collection of the Bibliothèque national de France. It was recently lent to château de Versailles for the Visiteurs de Versailles exhibition (also travelling to the Met this April). At the Versailles exhibition, this object was displayed as a place holder for the many the copies of this object that once travelled the world, even though this particular copy never left France. What fascinates me is the potential for extant copies of these medals to bear the burden of the histories of their sister objects that didn’t make it. Just as Clifford argued that travelling people bring back ideas from the outside world to their place of origin to create a networked culture, I’d like to propose that each and every multiple from a set takes a share in the many thoughts and ideas that were accumulated by other copies of the same object. This metaphysical network imbues these objects with a simultaneous plurality of meanings. And yet these objects sit mute in our collections, patiently waiting for us to tell the extraordinary stories of the life-changing travels of their siblings.